You’ll recognize them by their shoes. Because those shoes are not meant for walking. Their soles are red like the carpets for which they are made. They are Louboutins. Some just call them Christians. This year, the French shoe designer is celebrating 20 years of business. Since the very beginning, he has not only fascinated stars and models, singers and First Ladies. His sexually suggestive stilettos are a dream for nearly every woman. Dita von Teese? An addict. Lady Gaga? Just mad about them. Sarah Jessica Parker? Somehow disloyal. And Carla Bruni-Sarkozy? Done. She can’t wear them anymore, you know, because of the all too short Napoleon she is married to. I will never forget the day when a friend told me that in Australia girls paint the soles of their stilettos red to make them look like Louboutins. And then, the other day, I read an article about the dress code for the hippest bars in New York. 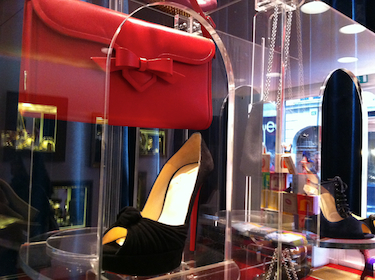 Michael Satsky, proprietor of Provocateur, at the Gansevoort Hotel, told the reporter that for women shoes are key. “Minimum five-inch heel”, he said and added “Christians are our favourite”, referring not to the faithful but to Christian Louboutin, of course. 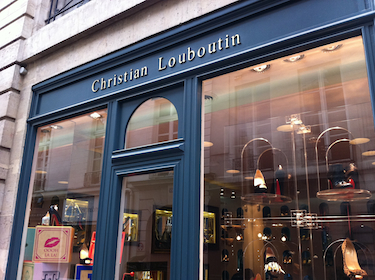 In Paris, Louboutin has three boutiques, one Left Bank, two others on the Right Bank. I somehow prefer the atmosphere of the boutique in Rue de Grenelle, it’s much more intimate than the one on Faubourg Saint-Honoré. The salesmen there look like they were cast by the maestro himself. They would easily get into the Provocateur. Even barefoot.